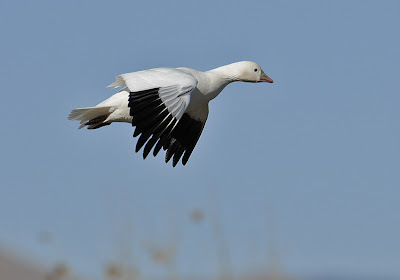 Snow Geese are in the majority, but not all are snowy white. 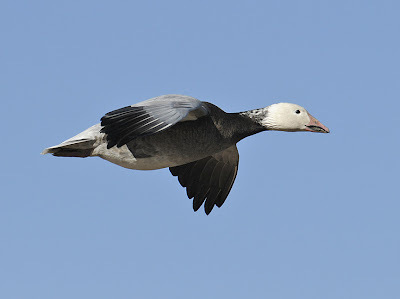 So-called "Blue" Geese, the dark morph, are smattered throughout the flocks of white birds for variety. 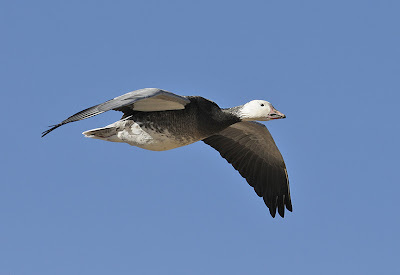 Some Blue Geese are "bluer" than others, and juveniles can look nearly all black. 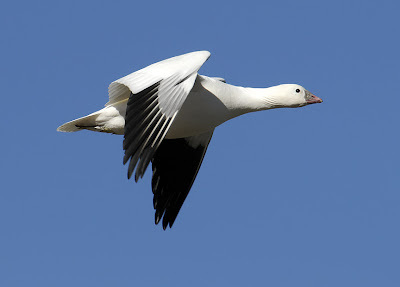 While larger than Ross's Geese, there are lesser Snow Geese that approach the diminutive Ross's in size. 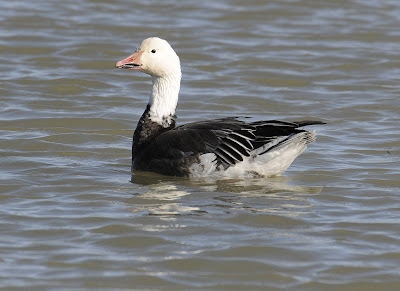 A distinctive mark to ID Snow Geese is the wide "grin patch" of combed black where the upper and lower halves of the bill meet (above and below the tomia, or inner cutting edges of the bill.) 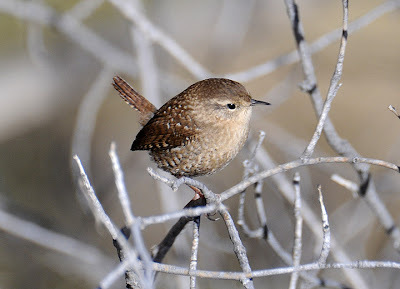 The bill also is longer than a Ross's and the junction of the bill and facial feathers curves outwards towards the bill tip. 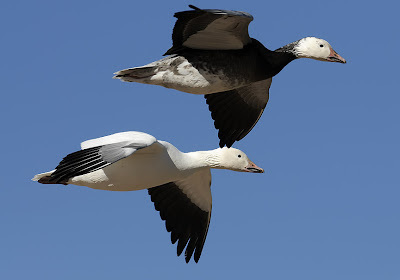 In flight you'll notice that Snow Geese have longer-looking necks than Ross's Geese. 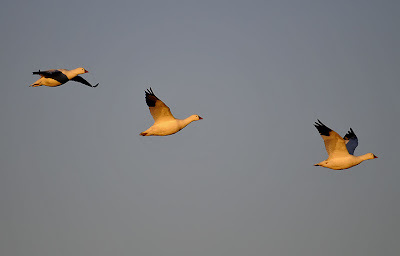 In contrast, Ross's Geese are the smallest in the bunch (but judging size on a lone bird can be a dangerous task, and about any white goose looks small amongst large races of Canada Geese.) 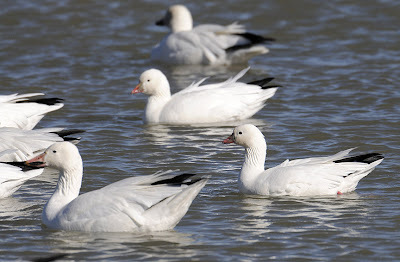 More importantly, they show little if any grin patch and have stubbier bills and necks. 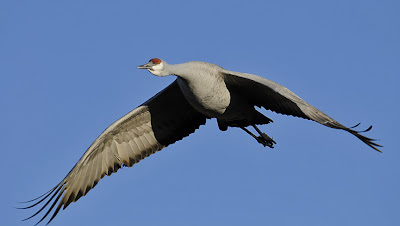 The junction of the bill and facial feathers is nearly straight up-and-down. Their heads look more rounded, and between that and the shorter bill I'll anthropomorphise and call them "cuter." 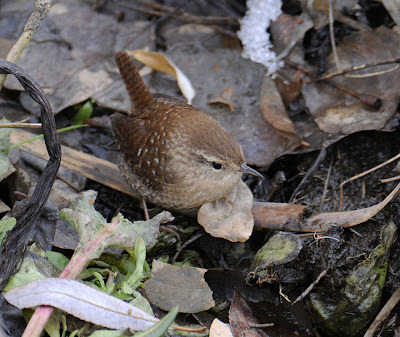 Not as cute are the bluish warty bumps (caruncles) that mature male birds develop at the base of their bill. 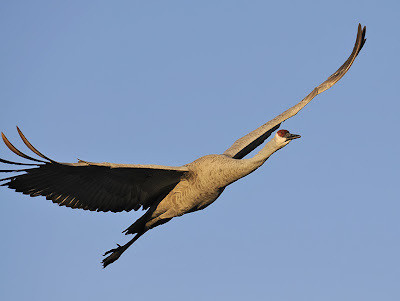 Sometimes problematic birds show up that don't quite fit either end very nicely. 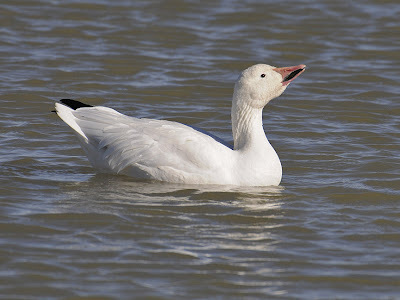 These hybrid Ross's x Snow Geese blend traits of each and typically have small grin patches. 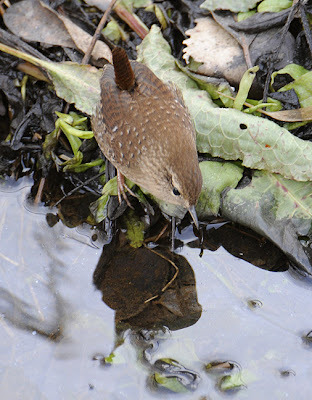 I suspect the bird below is a hybrid because its bill looks a bit longish and it has a little more grin patch then I'd like for a slam-dunker Ross's. 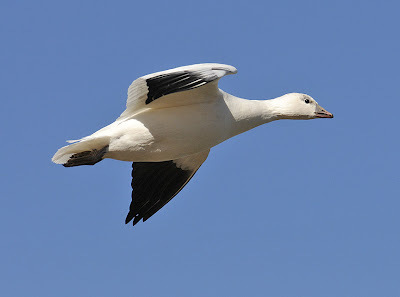 Here's a link to what I think is another hybrid Ross's x Snow Goose example. 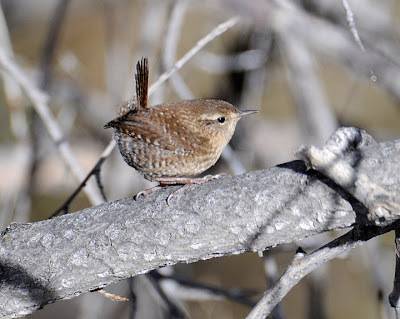 This past Thanksgiving day my buddy Ted Floyd found a Winter Wren along the mighty St. Vrain River ("mighty" and "river" to be taken with a grain of salt) where 63rd St. crosses it near Hygiene, Colorado. 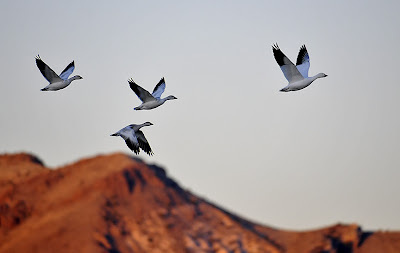 Always a rarity 'round here, extra interest in these birds in the state has recently developed as a split between Western (now Pacific) and Eastern birds is said to be a done deal. Ted thought the bird sounded great for Pacific, and I've learned to trust Ted where bird vocalizations are concerned. 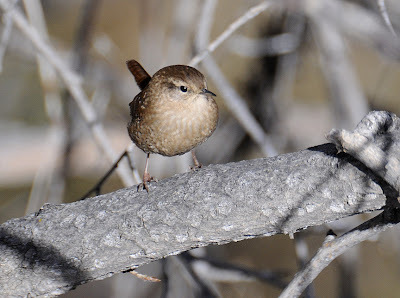 Confusing the matter, though, were later observations of an Eastern-looking &/or sounding bird there along with more Pacific Wren reports. 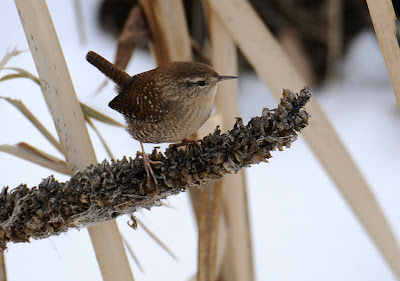 One observer reported seeing two wrens on 29 December, probably explaining any discrepancies. 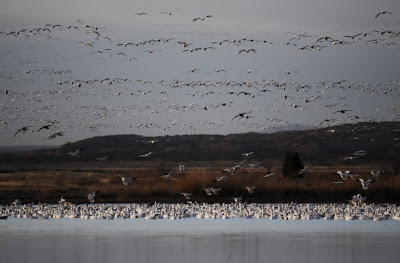 I was clear of the fray in New Mexico when the initial sightings were reported and missed the bird(s) last weekend when I finally tried for them. Today, however, I was cruising by and thought I'd try again. 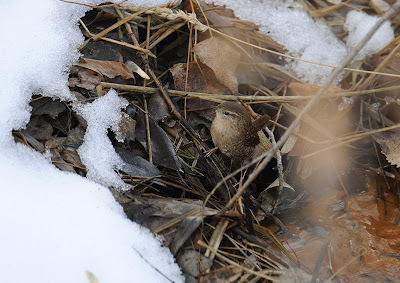 This time I heard a calling wren shortly after arrival, and a bit after that I saw it working its way along towards me. There is a little side stream coming in though a grating on the west side upstream of the bridge, which braids through a mini-delta 10 or 15 meters long before joining the St. Vrain. 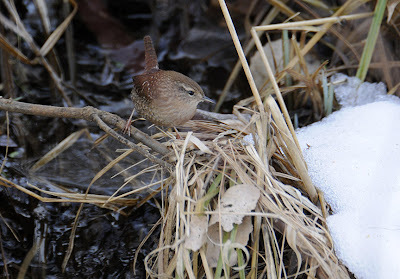 This appears to be warm water, perhaps spring fed, keeping green vegetation and a good micro-habitat free of ice despite the bitterly cold weather and snows of last week (I saw a Wilson's Snipe probing around in there when I unsuccessfully looked for the wren a week ago.) 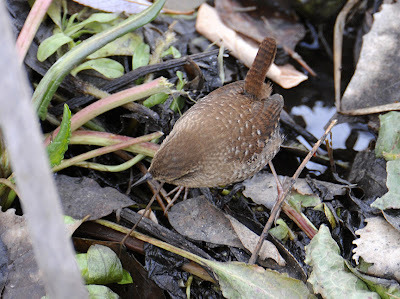 The wren worked itself along these tiny channels, disappearing for minutes at a time in clumps of grass or small shrubby vegetation. 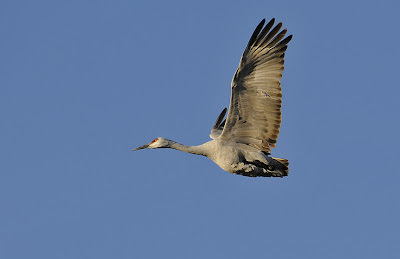 Eventually it was almost right below me as I peered down from the bridge. I was lucky to photograph it nabbing some insect (a torpid fly by the looks of it) from a nearby cottonwood sapling branch. 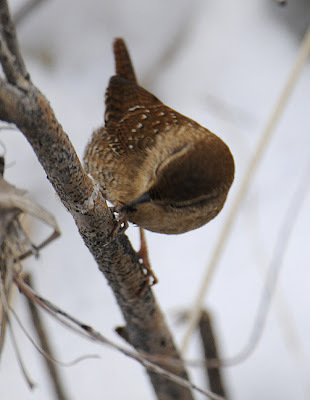 Finally, I whistled an Eastern Screech-Owl song for a bit which got it to temporarily jump up on a sunlit branch and call more intently, lending moral support to an angry Black-capped Chickadee in the canopy before it gave up on the ruse and went back to mucking around in the marshy shade. 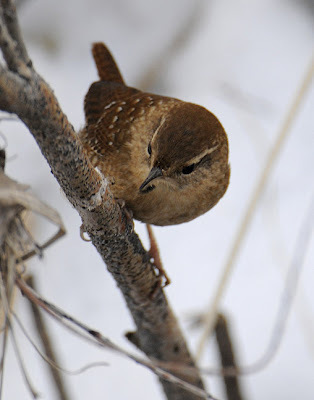 I don't have much experience at all with Winter Wrens, having seen maybe 2 western birds in Washington State and a singing Eastern in Wisconsin, plus a couple birds of unknown subspecies previously here in Colorado. 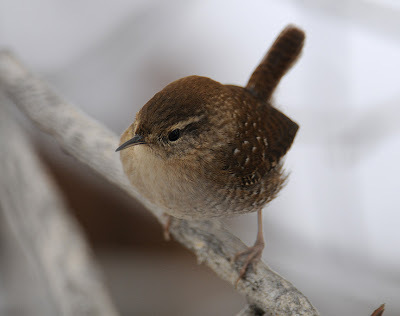 I thought the call notes of this bird sounded good for Pacific, using references such as the call tracks of Eastern and Western (Pacific) Winter Wrens on BirdsEye and on Nathan Pieplow's excellent Earbirding blog post regarding Pacific vs. Eastern Wren calls. I'm worried, though, that it doesn't quite look right to me for a slam-dunk Pacific based on the illustrations and photos I could find. 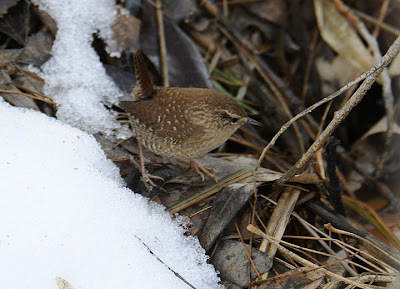 In my opinion it looks a little darker & richly colored overall than the typical Eastern (hiemalis group) Winter Wren but has more white spotting on the back than I'd like to see for Pacific, along with a bit more throat contrast than would make me happy. 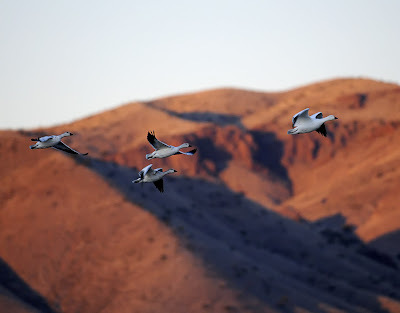 Still, In Pyle's Identification Guide to North American Birds (basically the bird banders' bible), he comments about geographic variation: "Weak to moderate differences are obscured by broad intergradation and individual variation." 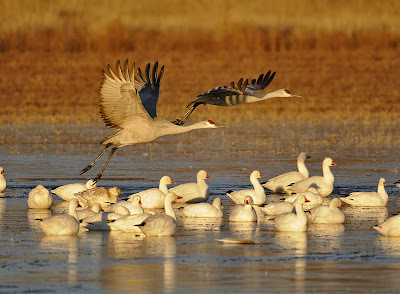 The star attraction at Bosque del Apache NWR is, of course, the Sandhill Cranes that winter there. They even have a namesake birding festival there the week before Thanksgiving each year. 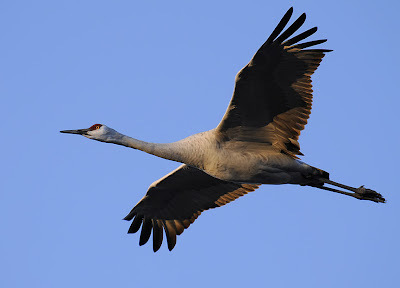 I've shot gazillions of crane pics all over the place but I still can't help but shoot a gazillion more (well, this time 1500 or so) every time I find another photo opp. 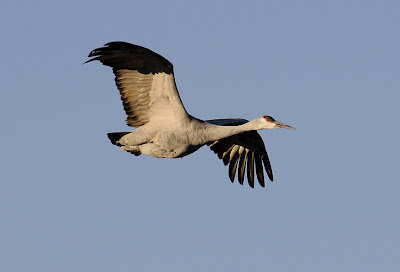 I've seen and enjoyed the crane show along the Platte River in Nebraska, which is breathtaking in its scale and something I'd suggest to any nature lover. 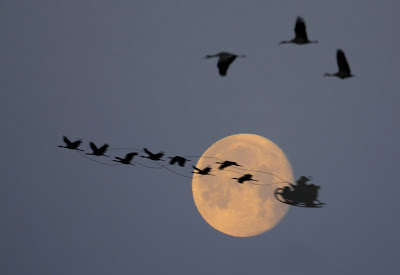 But for getting close, detailed crane shots I think the Bosque is tops. 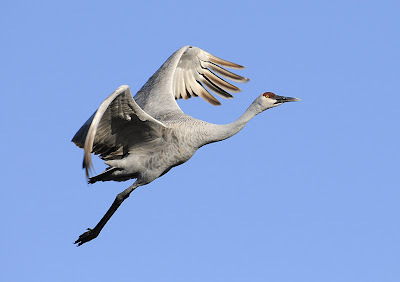 The cranes in Nebraska are hesitant to flyover low, wary as they are hunted along their flyways on the Eastern Plains. A limited number of blinds at the Rowe Audubon Sanctuary are available to get close but you've got to commit to spending the whole night in one. 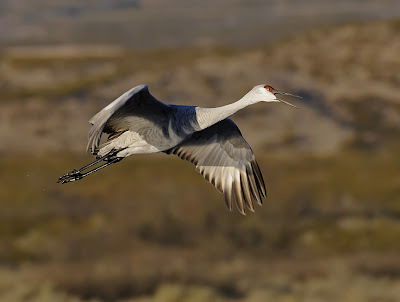 The Bosque cranes, however, are pretty tame and often fly so close they won't fit the frame. 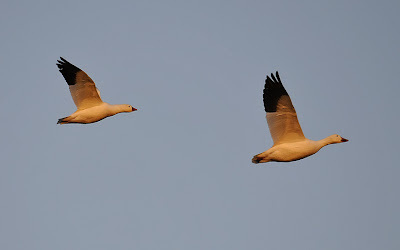 Their feeding behaviors are easily observed and their night roosts are close to the road and have great morning and evening light. 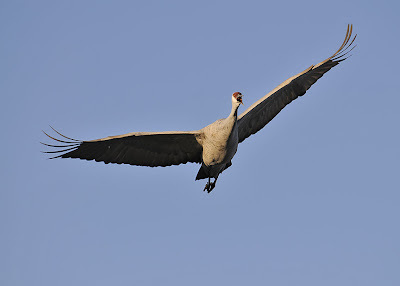 Most of the cranes this far west are greater Sandhill Cranes, but there are lesser Sandhills mixed in. 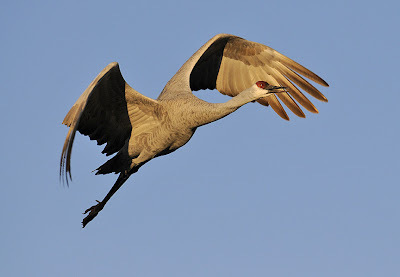 Not only smaller overall, lesser Sandhill Cranes have stubbier proportions with shorter-looking bills and necks. For some reason their cheeks look puffy to me- I think the shorter neck and bill contribute to this effect. 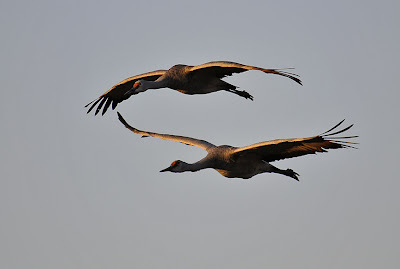 Greater (trailing) & Lesser (leading) Sandhill Cranes departing at sunrise. 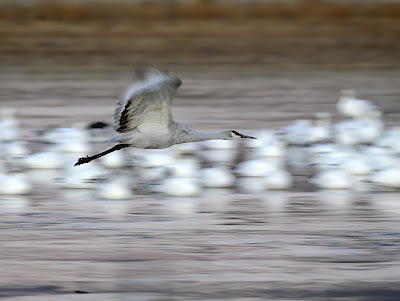 The cranes roost in shallow ponds created for this purpose. 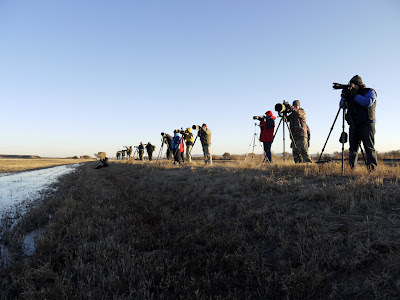 Two of the most popular among photographers lie along the entrance road, with levees along the east side allowing good access and tripod placement. If you ever want to see a lot of long lenses in one place this is it. 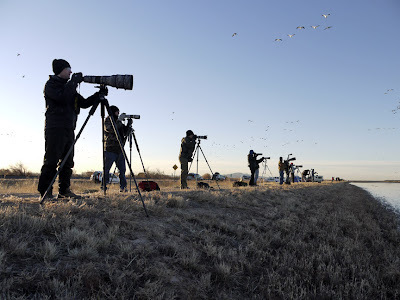 Many are here on their own but it is also a popular workshop destination and you will frequently see groups shooting together under the tutelage of an instructor. 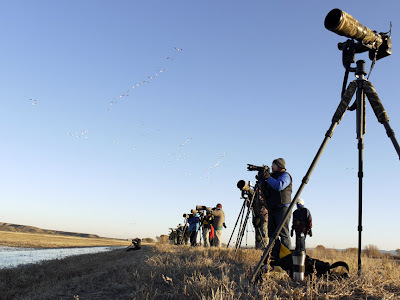 Once the cranes have departed in the morning it is a good opportunity to compare notes on equipment and technique, and to swap scouting reports from other nearby areas. 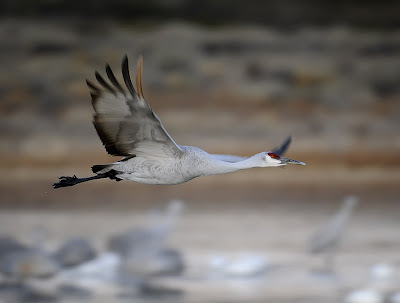 I rarely shoot off a tripod but in cases like this where I shoot from the same place over a long time it really helps to reduce fatigue and to pan on flying birds. In the foreground below you can see my rig (Nikon D300 with Nikkor 200-400mm f/4 G-AFS ED-IF VR ) on Gitzo GT3541L sticks and a Wimberly gimbal head. The gimbal head allows for perfectly balancing the camera so it stays wherever you point it and tracks flying birds effortlessly. I've got Lens Coat lens and tripod wraps and the wire you see on top of the camera body goes to a Nikon GP-1 GPS unit mounted on the hot shoe, which geo-tags my pics. Most importantly, note the stainless-steel insulated coffee mug on the ground, full of weak hotel coffee punched up with a spoonful of Medaglia D'Oro Instant Espresso. 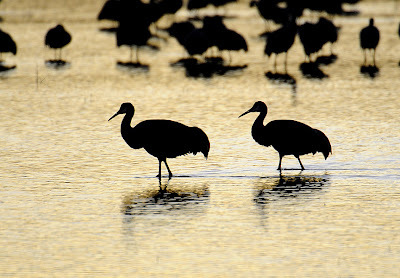 The shallow water of the roost pools gives cranes security against coyote sneak attacks. 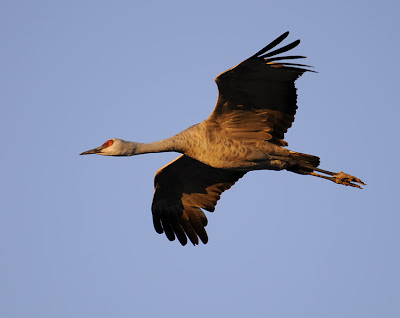 On cold mornings, however, thin ice forms and sometimes the cranes have to break themselves out. 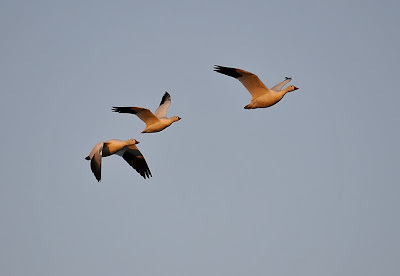 I've seen them occasionally fly off with rings of ice on their legs. 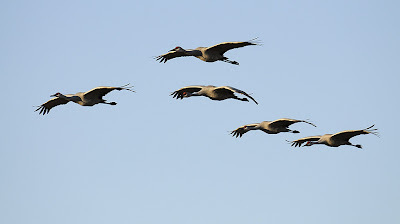 This year after a chilly night in the upper teens I observed several cranes tucking their legs up in under their bodies as they departed, perhaps to help thaw off the ice. 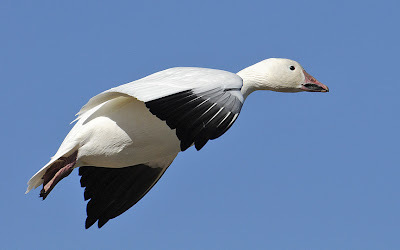 I only saw this behavior in the morning flight, and it gave them a quite odd legless look with a silhouette more goose or swan-like. 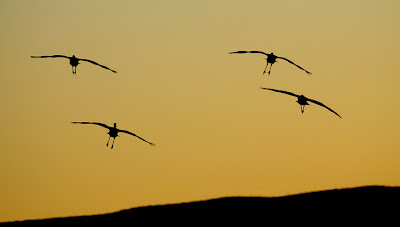 For a few golden minutes after the sun rises there is amazing light for snapping flying cranes as they depart. 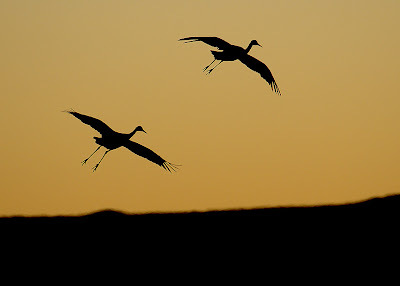 Then at sunset, the process reverses itself as cranes return to their secure roost. 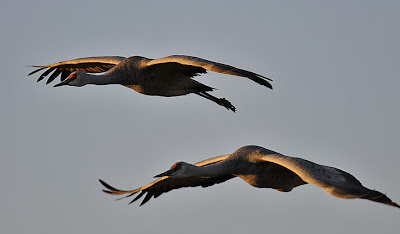 Again there is magic light with interesting contrasts and warm tones for a few minutes as the sun dips, accompanied by nearly the constant resonant trumpeting of the cranes. 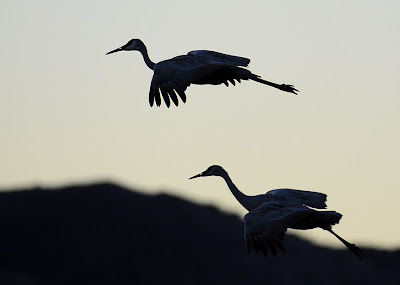 Post-sunset photography often switches to silhouettes against desert sky pastels and reflections. Another day at the Bosque done, back to the hotel to offload pics and review the day's shoots.